Stars are points that you can earn by participating in any of our innovative promotions, from Facebook shares to earning stars as you shop, or by becoming a brand advocate and sharing your very own referral link. Joining is easy! Once you're registered with a store account, (no purchase required to have an account) you'll have the opportunity to take part in all of the exciting ways we currently offer to earn stars. Once logged in, simply click on that green REWARDS button to launch the dashboard. See it? It's down there on the right. Share our brand on Facebook or Twitter via the Rewards Dashboard. Share your referral link and earn 300 stars when a friend orders. Go shopping for Photo Boards and earn 4 stars per £1 spent (before tax and shipping). When logged in and viewing the REWARDS dashboard (you guessed it, hit the green button), you will see your very own referral link. Sharing that link with your friends/followers will delight them with a 10% off code which pops up when they visit our website via your link and encourages them to purchase. If they place an order, the order is automatically traced to your link and you will earn 300 bonus stars when their order ships! There is no limit to how many referral stars you can earn in this way. Got lots of followers? Go for it! A FRIEND PLACED AN ORDER BUT i DIDN'T GET POINTS! 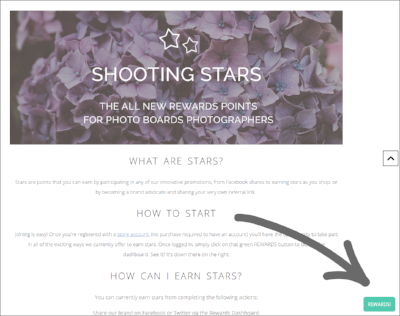 If your friend visited the website directly without using your link and promo code, stars cannot be rewarded to a referrer. Only orders placed via a referral link can be tracked back to the referrer. You cannot use your own referral link. Stars are rewarded once the friend's order ships. I JUST PLACED AN ORDER, WHERE ARE MY POINTS? Don't worry, Stars are automatically added to your account once your order ships. What can I EXCHANGE MY STARS for? Stars can be traded for rewards to spend in our store and you can monitor your growing balance through the dashboard. You can also see how many more stars are needed before the next reward is available to you. No, but the discount code you trade them for expires after a year. Discounts cannot be stacked in our store meaning only one code can be used per order. Make sure you are ready to use a discount before you trade your stars. It is a good idea to keep growing your stars balance to save for a bigger discount, instead of trading for a discount you might forget to use. HAVE I LOST MY POINTS FROM THE OLD REWARDS SYSTEM? No, we added your balance to your account when we moved to the new system on 18th June 2018. They still have the same value as before. The only difference is they are not itemised, your previous points balance is listed as a transferred total.